Our next Brand Ambassador describes perfectly the atmosphere in the office. 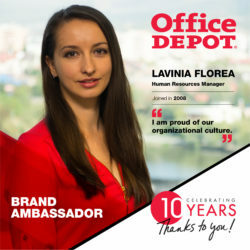 Lavinia Florea believes that the good energy brings people together in a company. 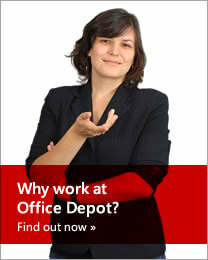 This is how we are at Office Depot– we do like to have fun at work. We are happy, alive, creative and smart! Below, you can find more details about her trip in our company. In my free time I am a PhD student in Management. I like to read, travel, watch a lot of TV shows and write on my blog. Lately, I discovered my passion for mountains and even did my first mountain cross in the Retezat Mountains (I had some “What was I thinking?? ?” moments during it, but I came through). I try to spend time with my friends and family which includes my cat, Norișor (she is somehow famous in OD, especially for the people who have known me the longest). I manage the HR department which entails recruitment, administration, payroll, engagement, talent management, comp&ben and communications. I try to set the tone in people practices, be an enabler, an engager and a problem solver. 3. Now going back at the beginning of your journey in OD, can you share with us what your job title was on the first day? And maybe a funny memory from when you joined? I joined in 2008 as a Trainer and at that time my responsibilities were to analyze the training needs, create and deliver the soft skills trainings. As a funny moment, I remember being put next to the guys from IT and I was informed that following week we would do Secret Santa. My piece of paper said: “Bogdan the daddy”. The IT guys were playing a practical joke on me and refused to tell me which one of the two Bogdan’s had a child. So, I had to speak with other colleagues to find out who Bogdan the father was. Meanwhile, I had made up my mind that no matter who that person was I would buy them a bottle of whisky. 4. What do you remember about your first day at OD? Describe some memories of how it was back then. It was Induction day and I had to pay extra attention because it would be one of my tasks to redesign the program and deliver it myself. I also have a vivid image of the office – I am working in the same physical area but now it’s set up differently. And of course, I remember meeting with the Head of the SSC who set up some clear expectations, objectives and tasks, which pretty much kept me busy for the next 2 years. 5. What was the funniest moment which you experienced in the current role? What happened? I am very proud of the organizational culture that I have helped build. I’ve been in the company almost every step of the way, being involved in many projects with many achievements: first, creating the training plan, conceiving all the trainings and implementing a learning management system, then another one. Then, when I expanded my first role, I streamlined everything related to HR. In this process, I became a Lean Six Sigma Green Belt. Then, I think of everything we have achieved in terms of company branding – from our site to the social media presence –, which is a pretty accurate representation of who/how we are. So I’m proud of my role in building this culture and spreading the word about it. I think determination is very important, doing things right, working hard, being open to learning continuously, trying to prepare yourself for the next step and expanding your skills. For example, when I joined OD I didn’t expect to become a little Excel guru. Or a Green Belt. Or a Project Manager. Or an HR Manager. Or to learn German. Somehow it happened. Also, what’s really important is trying to set the appropriate relations with everybody. You’ll not succeed without teamwork and effective communication. Lastly, I would advise people to always follow their principles. Maybe the fact that nothing major comes to mind right now shows that I’ve managed somehow, together with the help of others, to solve it. If I have to name something, I’d say it may be a challenge to recruit new people and keep the level of knowledge at the same standard. You need to start over and instill the values and the knowledge again. What’s certain about OD is that it’s never boring. You can almost certainly expect some changes around the corner, so you need to plan ahead – to think of what challenges you will face in 6 months from now. That’s something I do well – analyzing and strategic planning. I like to have multiple plans in store. What I don’t like is to be surprised by things that could have been foreseen. It’s part of good management practices to manage risks. If the risks occur, that’s fine, but at least you were prepared. I like to always be prepared, although I was never a ScoutJ. 9. What are the top 3 things you love about OD? The people, because everyone here is trying to be nice. If someone is not nice, people will tell them to be nicer. It’s a fun atmosphere – we are creative, smart and enthusiastic. I get energy from the people around me, just like I used to give everybody my energy as a trainer. Do you know that saying that you are the average of the 5 people that you interact with the most? In this case, thinking of my team and colleagues, I get a pretty awesome average! The culture – the way we collaborate, interact with each other, solve our problems; we easily get in the same boat with minimum conflict. Everything related to fun at work and life at work: we work hard but we also party hard. We do have these nice, creative, engaging contests for the associates where it’s really fun to win some prizes but also to see how creative people are. I’m really happy when we conceive these contests and see how well people respond to them. When I joined OD, the mission statement of the company was “delivering winning solutions that inspire worklife”. OD registered “worklife” as a trademark saying that we want you to feel happy and alive at work and not regard the office as the place where you need to escape from in order to go home and live. I went on to be inspired by this mission statement: I come gladly to work because this is where half of my life is; working is not the thing I need to do before I go home and enjoy my life – I actually enjoy life every day at the office. I’m not sure if I have a motto but if I had to pick one, I would defer to Metallica’s words: “forever trust in who you are and nothing else matters”. It means don’t listen to some of the things other people say, because you are unique and have your own way. Sometimes people can decimate your confidence with their opinions. If you lose your self-confidence it’s really hard to recover from it. The first motivator in your life should be yourself. And other than that I have some principles that I don’t want to ever give up on: be fair, always speak your mind, and never make a compromise that might compromise you.